Every recipe in Williams-Sonoma Bread has a side note that relates to the entire recipe, or a specific ingredient, or even the way in which you're supposed to bake the bread. For this recipe, the side note has to do with an ingredient. "CORNMEAL: Cornmeal has a grainy texture and a unique flavor. In supermarkets, the most common type is degerminated cornmeal, which has had its germ removed for a longer shelf life. For the best flavor, use stone-ground cornmeal, which is whole grain and fresher tasting (and should be stored in an airtight container in the refrigerator or freezer). 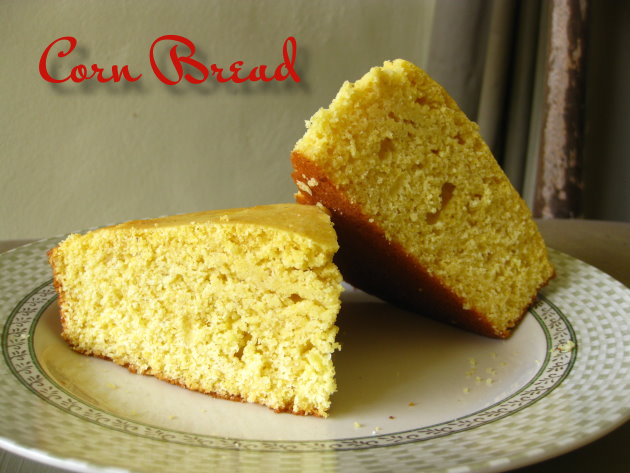 Coarse- or medium-grind cornmeal may be substituted in this corn bread recipe, but the texture of the finished bread will be more crumbly." 1) Preheat the oven to 375F. Grease a 9-inch round springform or square pan. 2) In a large bowl, stir together the cornmeal, flour, sugar, baking powder, and salt. Make a well and pour in the milk, eggs, and melted butter. Stir together the wet and dry ingredients just until combined. Take care not to overmix; the batter should be slightly lumpy. 3) Pour the batter into the prepared pan. Bake until the bread is golden brown around the edges and on top, 25-30 minutes. A cake tester inserted into the center should come out clean. Let stand for 15 minutes, release the pan sides (if using a springform pan), then cut into wedges or squares, and serve.